Prop 111, which would limit interest rates and eliminate all other fees associated with payday loans, is projected to pass. KUSA — Proposition 111, which would lower interest rates to 36 percent from 45 percent (Colo. Rev. Stat. 5-3.1-105) and eliminate all fees associated on payday loans, is projected to pass. A poll conducted three weeks before election day showed Prop 111 with 84 percent support among registered voters with a 3.5 margin of error and a sample size of 800 voters. The University of Colorado's American Politics Research Lab conducted the poll and on YouGov. A committee, Coloradans to Stop Predatory Payday Loans, spent over $2 million to persuade voters to pass this proposition. 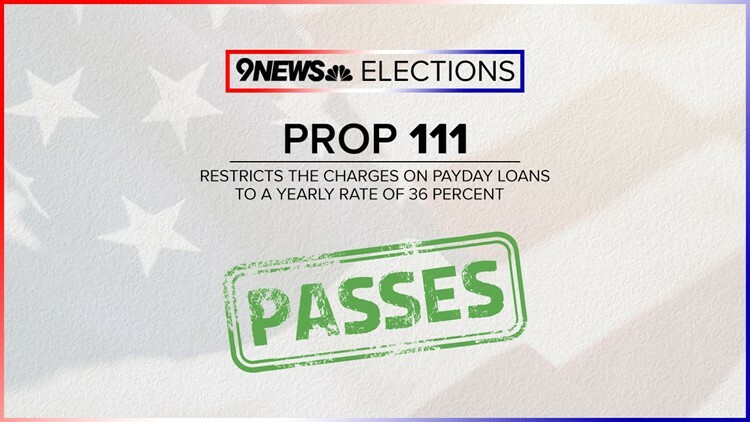 According to the Colorado Blue Book, opposition to the ballot question centered around the fear that these new limitations on APR would effectively kill payday loans in Colorado. Opposition also said more regulations were unnecessary.